PHILIPSBURG - The Joint Court of Justice on Wednesday was expected to give its decision on a request to suspend the detention of casino boss Francesco Corallo during a closed-door session. Instead, the Prosecutor’s Office and the defence presented new arguments, which led to a new delay. The Joint Court will now give a decision in this case by Tuesday, June 27, at the latest. Based on a “Red Notice” issued by Interpol, the Anti-Corruption Team TBO of the Kingdom Detectives Cooperation Team RST arrested Corallo on the request of the authorities in Italy on December 13, 2016. He is suspected of tax evasion, misappropriation of money, money laundering, and membership in an international criminal organisation. The Court of Appeals on Tuesday afternoon declared Corallo’s extradition to Italy permissible. 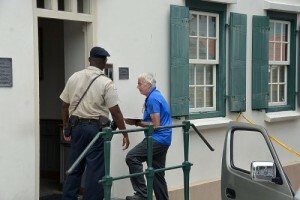 Via a brief video-conference from Curaçao, Corallo was informed that the Joint Court considered his extradition permissible, and that the Court will give the Governor of St. Maarten a positive advice. In its advice to the Governor, the Appeals Court said that in taking a decision on the extradition it should be taken into account that Corallo, in case of a conviction, must be able to sit out the remainder of his sentence in St. Maarten. Besides, the lawyer pointed out, that based on a High Court ruling the Italian authorities would also have to guarantee that a possible sentence may be adapted according to St. Maarten law. It is the defence’s standpoint that the Italian authorities are not able to guarantee such an adaptation, as this is not possible under Italian law. “The one and the other has been confirmed by the High Court, so that, in our opinion, the request for extradition cannot be granted,” Sulvaran said. The defence requested the Court to declare the Prosecutor’s Office inadmissible in its request for extradition. In the meantime, the defence pleaded for Corallo’s release from detention, if necessary on bail. Corallo has been held in detention at the Police Station for six months. Since then his lawyers filed three requests for Corallo’s conditional release on December 19, 2016, and on February 2, 2017, and March 21, 2017, which were all turned down by the Joint Court. In April, Corallo filed a complaint with the European Human Rights Court protesting the fact that he has been staying in a cell which measured 16 square meters and which he often had to share with five, six or seven other persons. Furthermore, the cells were dark and unhygienic and there was a foul odour. The unhygienic circumstances caused a dental infection, Corallo claimed in citing abuse of his human rights.